1801 (Mar. 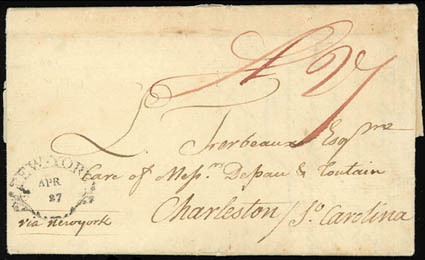 27) St. Pierre, Martinique to Charleston S.C. via New York, datelined folded letter carried by private ship, entered mails with "New-York, Apr 27" clamshell postmark and red manuscript "Sh 27" rating for 25¢ inland postage plus 2¢ ship fee; light file folds, Very Fine and early use from Martinique. A link back to Sale 75 - Lot 191, along with its description, will be appended to your message.